I shared this recipe on DeDa Studios about a week ago...With the July 4th holiday coming this week I thought maybe some you of might want to give this a try for your celebrations this 4th. Easy & Delicious! - Perfect for outside celebrations! Super easy to make and very refreshing. Mix all ingredients together and chill! When ready to serve add about another 1/4 of the bottle of the Italian Zesty Salad Dressing. That is very similar to the way I make it and let's just say that it's always a hit at summer cookouts. I make mine like this too! I need to make a side for a party, maybe I'll whip this together! I love pasta salad. Especially served in the summer with a barbecue or picnic! Oh this looks super yummy! I love a good salad. Will have to give this one a try. Thanks for the recipe. Looks Oh So Good I Can't Wait To Make Thank You My Family Will Love It! Yum I love italian food! I love pasta salad. Thanks for sharing! I am going to add this to my must make list! I love pasta salad of all types. Thanks for sharing this recipe! I love pasta in general so this looks very yummy to me! We make a similar salad! Definitely a summer favorite! Ooh, I think I'll make this for our barbecue this weekend! wow that sounds really delicious I love that you added artichoke hearts to the recipe too! YUM! Yum! 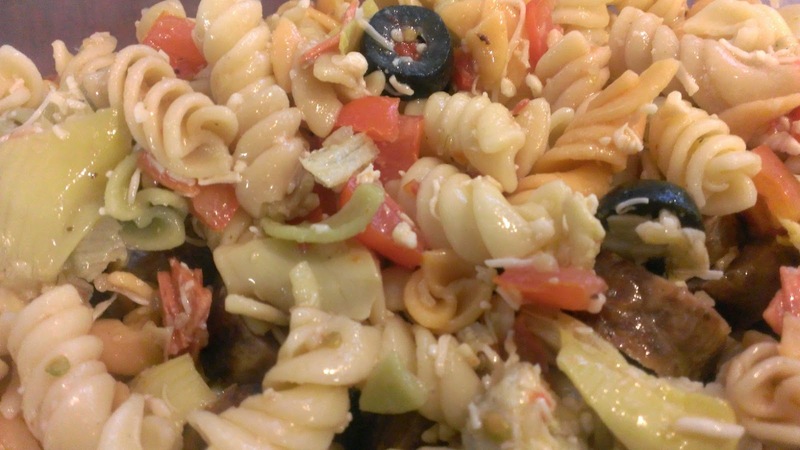 I've never been a huge fan of this type of pasta salad, but I know several who are. Will definitely be passing this along. This looks delicious. Thanks for the recipe. I don't think I've ever made a pasta salad. How crazy is that?! It's so simple to do, that I have no excuse not to. yum, this sounds good! I think I have all the ingredients to pull this off today! Love salads like this. So tasty and great for gatherings.